As Christmas is just around the corner, I want to get my readers prepared for their shopping extravaganzas! Forget the cold and the long, crowded lines – why not make things as easy as lying on a beach in Hawaii? Perhaps actually getting to Hawaii might pose as a challenge, but with the help of online shopping and the delightfully aromatic scents from Malie Organics, holiday shopping just got a whole lot easier! This holiday season I teamed up with Malie to review 3 of their amazing products in the Hibiscus scent. I am a HUGE fan of this brand and I have tried many of their products and scents. The products featured in this image are: the Hibiscus Island Ambiance Travel Reed Diffuser, The Hibiscus Perfume Oil (Roll-on), and the Hibiscus Soy Travel Candle. These three products make the perfect stocking stuffers. 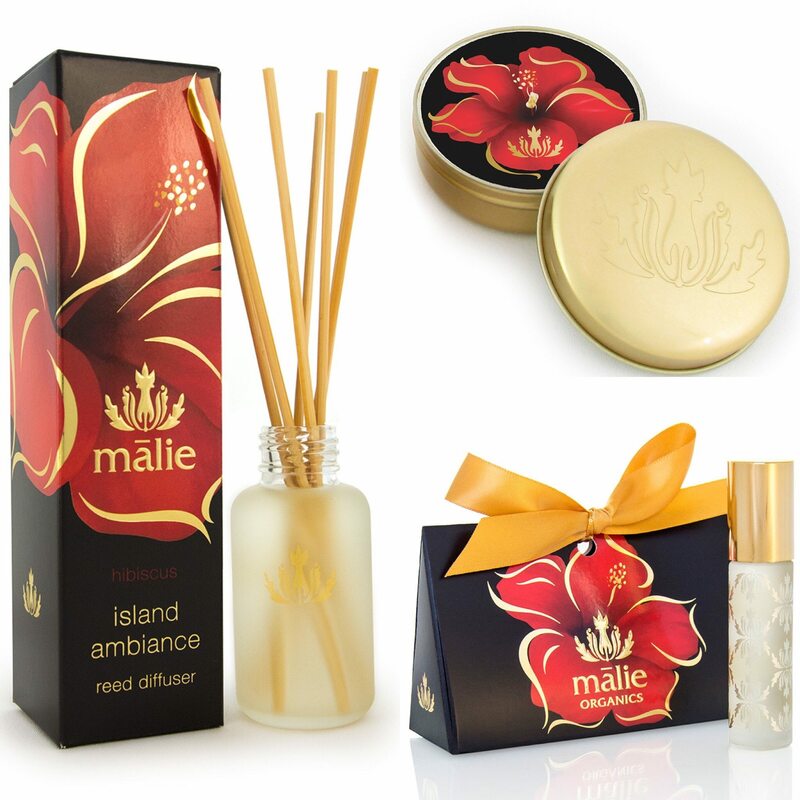 Malie even has gift sets, which will make the perfect present for the holidays. What better gift to give this holiday season than the precious aromas of Hawaii? Thank you Malie Organics for sponsoring this post! the all-natural qualities of the brand and my personal favorite, the pikake scent! The Malie Organics look so fragant and relaxing. Thanks for posting as you are right, these would make great gifts for the holidays. As someone who loves flowers, I’m sure you know exactly how amazing these floral scents are. Especially all being indigenous plants in Hawaii, it’s so authentic! Thanks so much Nicole, you are so sweet! Exactly! I agree with everything you’ve said. 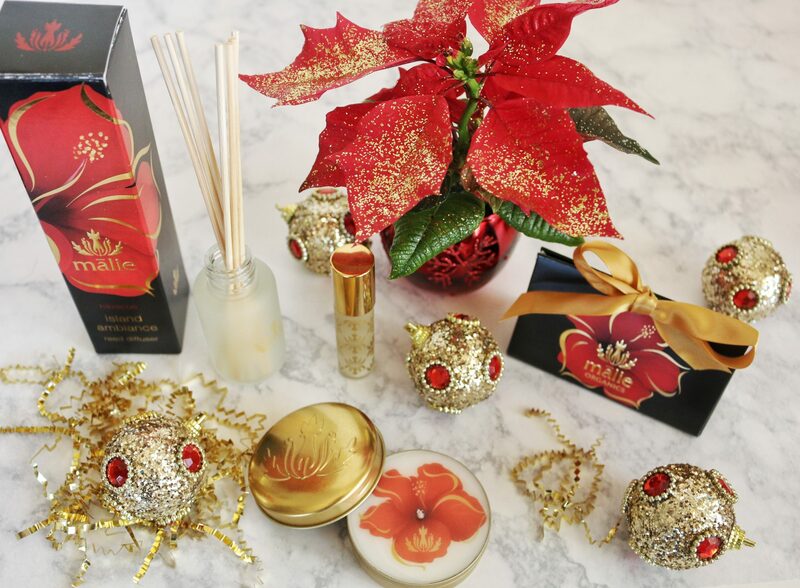 The hibiscus packaging is so perfect for the holidays and you NEED to try their products, I love each and every one! I love their products! They always make me remember my time in Hawaii! I would love to receive these as a gift! I haven’t been to Hawaii but I’d love to go. Definitely on my bucket list! Sounds like a fabulous stocking stuffer! Well, I think you did a fabulous job describing the scent– call me captivated!! : ) Iove getting little stocking stuffer ideas. These are so cute!! Thanks for sharing. This is such a great idea for a stocking stuffer! Love it, that description totally took me to Hawaii, wow! You need to try their products, they are sooo amazing my words do them no justice! These sound amazing! I need to grabs some for stocking stuffers! I love the packaging on this! Very festive and nice, perfect for gifts for co-workers. That’s such a great idea! And they have full-sized version of these as well. I love the smaller ones because they are great for stockings and smaller gifts! Ooooh, this sounds amazing. The description of the scent makes me want to try it right away. What a perfect stocking stuffer! I’ll need to check them out! Definitely do, you won’t be disappointed! i LOVE their plumeria scent! smells so lovely! oooo I love fun scents for the holiday season! Great idea for a gift! And this isn’t your typical Christmas cookies or pine scents! Right?! Such a unique gift and perfect for the holidays! Mmm that sounds great!! I have never heard of them but I’ll have to try it! Maggie you would love their stuff! These are such great options. I wish I could try some now! Malie looks like such a great brand and you seem to know so much about them, I’m intrigued! They are my favorite! I’ve tried their candles, beauty oil, perfume, diffuser, shampoo, conditioner, body wash. I think the only thing left is the lotion, hahah! I love every single product they make! I’ve not heard of this brand, but I’ve been looking for a good new diffuser lately….need to check this out! Wish I could smell through the phone. I bet that hibiscus scent is everything I need in my life!! I bet it is too! You NEED to try it! These look like perfect stocking stuffers! I will have to try out their products! Also can I just say that picture you took deserves to be in a magazine?! The diffuser is great! The scent is strong and it really does brighten up a room! Sounds heavenly! I’ve never been to Hawaii, but I imagine it smells amazing there, Ha! Now I feel like I need to go snag these beauties! Love the packaging!! the packaging of these products are so pretty and hibiscus scent sounds heavenly! Perfect stocking stuffers for Me ! I can’t decide between the diffuser or the oil. And then which scent….. Guess I will get both and vary the scents. Thank you for the lovely ideas.